Maldives Police Service has arrested two suspects who attempted to smuggle alcohol into Hulhumale’. The joint-operation between Hulhumale’ Operations and Police Intelligence as part of the MPS’ anti-narcotics campaign. The operation was run at 10:50 pm on April 11 based on an intel report of an attempt to smuggle alcohol into Hulhumale’ via a dinghy boat. The two suspects arrested in the operation have been identified as a 23-year-old Maldivian male and a 28-year-old Maldivian male. They were stopped and checked by police officers after they claimed a black plastic bag which was offloaded from the dinghy and attempted to drive away on a motorcycle carrying the bag. 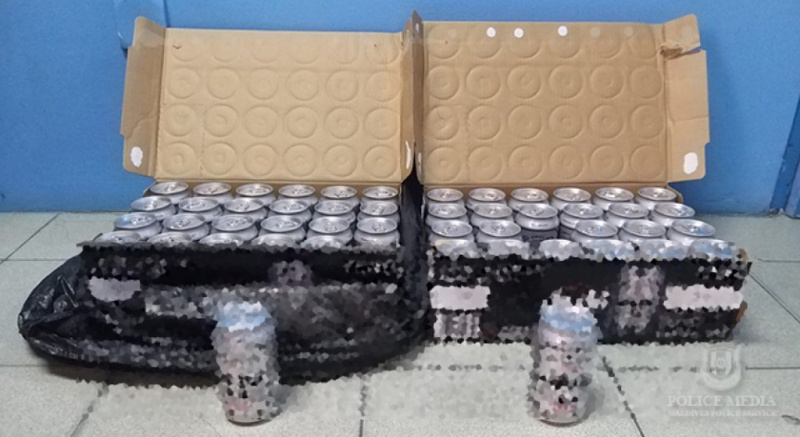 The officers found 48 cans of an alcohol product inside the bag. Maldives Police Service reports one of the suspects assaulted a police officer involved in the operation. Both suspects have been remanded to seven days in a detention facility determined by the Ministry of Home Affairs by the Hulhumale’ Magistrate Court. The case is under investigation by the Hulhumale’ Investigation.